L-carnosine prevents glycation, a random process that occurs when a protein molecule bonds with a sugar molecule without the necessary enzyme to manage its action, resulting in impaired body functions. In this aspect, it is an antioxidant that protects the human organs from cell damage caused by internal and external factors. Internal factors include insufficient supply of L-carnosine in the body and external factors are the free radicals in the environment that bring stress and injure the human body at the cellular level. Those practicing a vegan diet (no animal products can be at risk of lowered L-carnosine levels if they don’t replace the depleted supply. Elderly individuals also have diminished capacities to produce L-carnosine. Protects the brain from aging. L-carnosine prevents the increased production of oxidants, nitrogen & blood sugar that is triggered by the release of free radicals, putting the brain cells at risk for premature degeneration & aging. 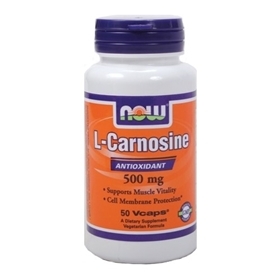 L-carnosine supplements play a significant role in reducing toxicity to the brain and preventing the onset of Alzheimer’s disease, Parkinson’s disease and other neurological conditions. Protects the cardiovascular system. The antioxidant powers of L-carnosine protect the heart and blood vessels from stress by scavenging the free radicals and blocking toxins. It helps in lowering the bad (LDL) cholesterol that clogs the arterial walls and increases the risk for strokes, heart attacks & other cardiovascular conditions. Lessens the risk for diabetes- L-carnosine controls the elevation of blood sugar that leads to diabetes by preventing the glycation process and increasing the number of insulin-secreting cells in the pancreas. Promotes wound healing. Post-operative wounds heal faster when L-carnosine levels are sufficient in the body. In one study on humans, there was higher tensile strength of the skin at the operative site if L-carnosine was included in the diet. The combined action of the dipeptides in L-carnosine were the result of stimulation of early effusion & enhanced collagen synthesis. Blocks cataract formation and improves vision. L-carnosine has anti-glycation properties that protect the eyes’ lenses from the formation of cataracts and prevents vision impairment. Its protection against the onset of diabetes also benefits the eyes since diabetes is a risk factor for vision issues. Defends against cancer- As an antioxidant and anti-inflammatory agent, L-carnosine supports DNA synthesis and stops its destruction, which can be the cause of cancer. It hinders the metabolism of cancer cells and helps in the prevention of metastatic growths, with it's anti-oxidant properties. It also helps reduce & eliminate of the Helicobacter pylori, the bacterium linked to stomach and peptic ulcer. A recent study found that there is evidence that the release of carnosine from skeletal muscle during physical exercise affects autonomic neurotransmission and physiological functions. In particular, carnosine positively impacts the activity of sympathetic and parasympathetic nerves that supply energy to the adrenal glands, liver, kidney, pancreas, stomach, and white and brown fat tissues, thereby causing beneficial changes in blood pressure, blood glucose, appetite, lipolysis, and the thermogenic burning of fat. Carnosine is a natural antioxidant and anti-glycation substance found in normal human tissues, predominantly in the brain and heart. Carnosine helps prevent cardiovascular damage and brain injury through a host of mechanisms closely related to the interplay of glycation, oxidation, and inflammation. Suggested Usage: As a dietary supplement, take 1 Vcap® 1 to 2 times daily, preferably with meals. Consider taking this product in combination with NOW® L-Proline, Vitamin C and L-Lysine.